The view from Tony\'s On The Lake in Coeur d\'Alene. Tony’s, about five miles southeast of the Coeur d’Alene Resort, sits alongside one the lake’s many inlets, a location that allows diners to feel far from Coeur d’Alene’s summer bustle. The Northern Italian-influenced menu is also far from what is offered at other establishments. Appetizers like cicchetti, small Venetian plates that include items like almond crusted duck tenders, toasted ravioli and fried dough with salami (gnocco fritto con affetati) are available alongside more familiar antipasto salads with items such as gorgonzola cheese, spiced pecans and pomegranate vinaigrette. The menu is full of seafood options — mussels, calamari, prawns and fresh fish of the day — but turf is also well-represented. Veal, beef short ribs, sirloin and thin, pounded pork accompany all Italian cuisine necessities like risotto, Tuscan potatoes, polenta, sautéed mushrooms and Marsala sauce. Diners consume these delectables while viewing Lake Coeur d’Alene, the Centennial Trail and boats along the docks. Tony’s provides outdoor deck seating but the restaurant’s interior, with its fireside area, warm tones and tasteful décor, is definitely a place well suited for a special occasion. 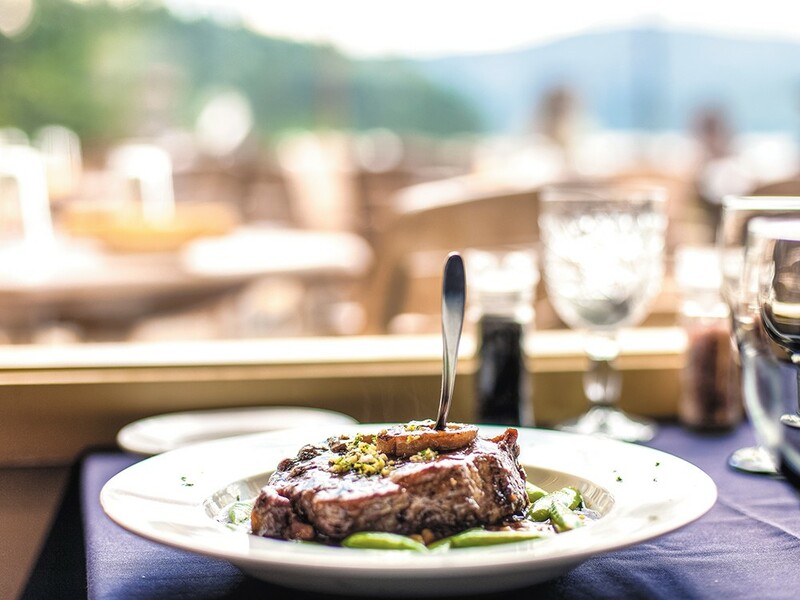 Billed as “casual lakeside dining,” The Bistro is a great choice if you want to get out of town on short notice without depleting your gas tank. It’s only 15 miles southwest of Cheney, which is 16 miles southwest of Spokane. You might want to pack your binoculars so you can watch the fowl from nearby Turnbull Wildlife Refuge skim the well-stocked waters of Lake Williams and feast on any of the five species of trout found in the lake. Or just do your own skimming and feasting. Your choices include classic burgers with cheese and bacon, chili burgers, and a burger with ham and cheese. There are sandwiches perfect for a lakeside lunch — pulled pork, Reubens and BLTs. For something lighter, try any one of the salads — caprese, wedge, Asian or the shrimp Cobb. All the dressings and sauces are made in-house. Entrées like the Cougar Gold mac and cheese and the fish and chips are always on the menu. On weekends, chef Jerry Schrader tries out specials, including oysters and lobster. For some, lakeside dining means romance. For others, it’s a chance to wind down near nature. For those of us without boats, dress shoes, binoculars or dates, there’s Rooster’s Waterfront Restaurant on the Snake River (not that you can’t go there with dress shoes or a boat or maybe another person). You will, however, need a full tank of gas. Rooster’s is way down south in Clarkston, but worth the trip if you’re looking to sample some blueberry barbecue ribs or an appetizer like Kabooms (pepper jack cheese, black olives, all kinds of veggies, cream cheese, and buffalo sauce, stuffed into an egg roll and deep fried — kaboom!) For entrées you will find salads, surf and turf, ribs, steak, burgers, sandwiches and a wide range of fish, both shell and not: halibut, tuna, catfish, oysters and shrimp. The cocktail menu features martinis, hurricanes and something called a gnarly lemonade. Some say Roosters is the Northwest version of Joe’s Crab Shack, but you’ll have to get down there to see for yourself. Priest Lake is known for its scenic beauty, which gets even better when you can eat it. Many of the items found on the plates at the resort’s restaurant are found in the surrounding area. Breakfast omelets are made with local, wild Chanterelle mushrooms. The pancakes run purple with huckleberries. And it’s hard to imagine having a bad day when it starts with a huckleberry-and-strawberry mimosa. If you don’t wish to leave before dawn to reach your breakfast destination, that’s OK too. Lunch at Hill’s brings choices like grilled Portobello mushroom with mozzarella and balsamic reduction or the Lamb Philly Cheesesteak, preceded by such appetizers as in-house smoked salmon or oyster shooters. Lunch favorites include simpler fare like fish and chips or shrimp baskets. And you have to love a place that serves old-fashioned milkshakes. Dinner features mesquite broiled meats as well as house favorites like pepper steak or scallops and pesto. Finish up with some homemade cheesecake or huckleberry pie, but include an espresso. It could be a long ride home.